Once there was an app on the AppStore called BatteryLife that managed to dodge Apple’s iTunes Review Team and offered features to users that Apple would have not normally been allowed. Using this app, iPhone users were able to find how many charge cycles the battery has been through. This app still exists but does not offer as many features as it once used to do. Another app, the Battery Percentage, offered similar functionality but was removed from the App Store. 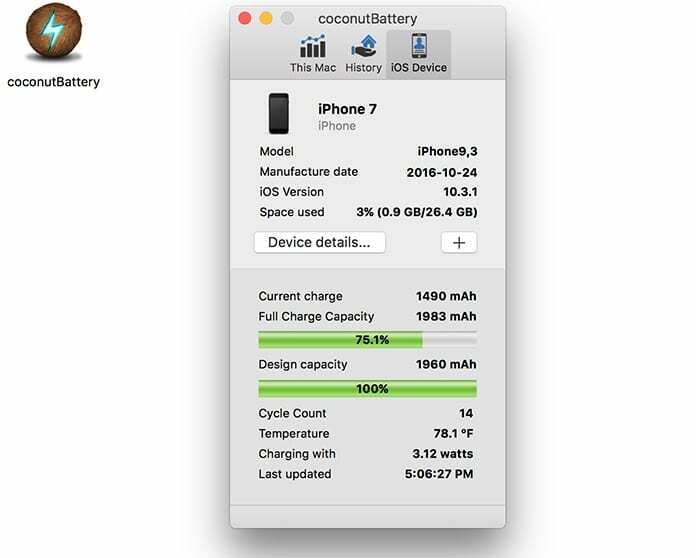 Read on to learn how to check iPhone battery cycle count with CoconutBattery app. If you own a jailbroken iPhone, you most likely have no trouble accessing such apps but many users with non-jailbroken devices also want to know the detailed information about their smartphone’s battery. This is now possible thanks to an app called CoconutBattery, however, you won’t find this app on the App Store. 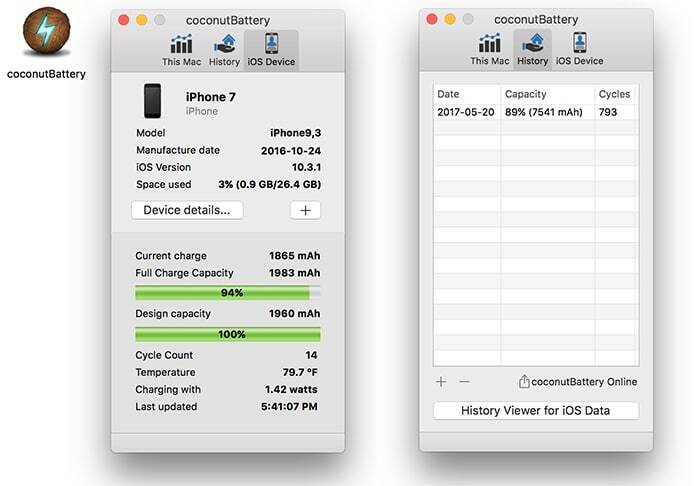 CoconutBattery is a highly resourceful app for MacOS that provides detailed information about your iPhone’s battery. Although the removal of the aforementioned apps did not do that much harm to the user experience per se but it definitely took away many handy features from those who love to a keep a check on their battery’s performance. If you are one such user, Coconut Battery can be of extreme use but as mentioned earlier, it cannot be installed on the iOS and will have to be installed on a Mac. Users just need to plug in their iPhone and the app will instantly show the model, manufacture date, the current OS installed and how much of the storage space has been used. Most importantly the app will also display the current charge of your device along with the maximum charge available and the design capacity i.e. the amount of charge a device is capable of holding since its manufacture. The app even presents the users with load cycles which means you’ll be able to see how many charge cycles the battery has gone through since it was bought. 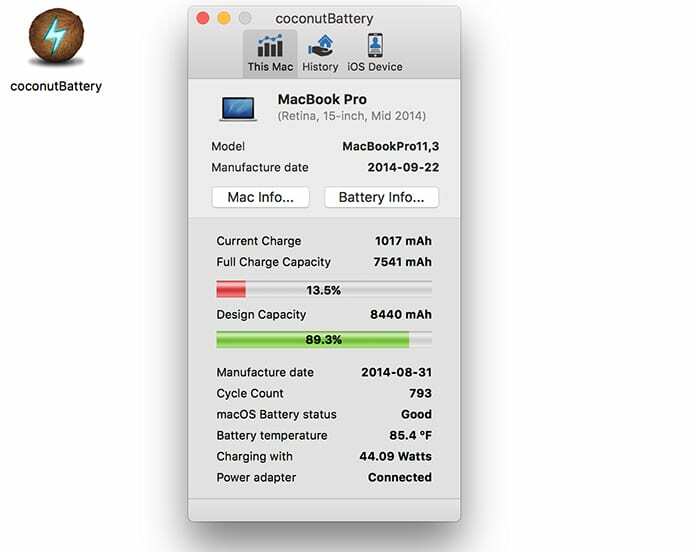 If that’s not enough, the CoconutBattery can reveal all these details about your Mac as well, on which the app is installed. This an impressive amount of functionality from an app that is free, easy to use and lightweight, all at the same time. It not only allows you to judge the performance of your iPhone’s battery but can also give you an insight about how the battery will degrade over time. The CoconutBattery app for Mac can be downloaded free of charge from the following download link. After the download, just move it to the Applications folder or just run it and connect your device to check the battery cycle count.